Us Brits are well known for our obsession with the weather, and for those of us who like to know what's going on in the Cumulonimbus and Cirrocumulus departments at any given point of the day, the 4Cast mobile weather app for the Palm platform is one of the very best we've seen. Able to download the latest Yahoo weather updates via hotsync, Bluetooth or wireless download, 4cast makes it easy to add your own list of city forecasts which can be updated individually or all at once. The main home screen displays one city at a time, and scrolling down reveals a flotilla of meteorological nuggets, starting with a day-by-day summary for the week ahead, complete with some rather dandy-looking weather icons. Clicking down on the Palm's 5-way controller takes you to a more detailed screen stuffed full of useful information, including wind speed and direction, humidity, visibility, barometric pressure and sunrise/set times. The next screen serves up a rather natty graph showing weather trends over the week, complete with a max and min temperature graph. A nice feature is that if you select another city (by using the right button on the d-pad) you get taken to the equivalent data of other cities in your list, so it's easy to compare the weather in different locations. The final screen offers a day by day summary for the week ahead, including weather conditions, temperature and wind data, with the option to pull up weather maps and check out any weather alerts that may have been flagged up. 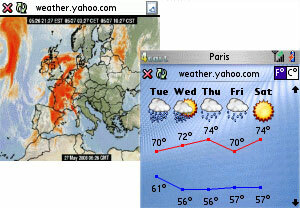 Although there's no shortage of free and commercial weather programs available on platforms like Palm, Blackberry, Windows Mobile and Symbian, we have to say that 4Cast is just about the most attractive and pleasant one we've seen thus far. Even better, the program integrates with superb TAKEphONE contacts/dialling app which we enthusiastically frothed about back in August last year, adding a neat weather bar to the homepage. Although there's no denying that the Palm platform has been pushed into the shadows of late, the responsive and friendly developer has created a product that stands up to the finest on any platform, and at a temptingly low price of a fiver we can thoroughly recommend it.